If we look at the Domesday Book of 1086 we will find a single entry for Thame, spelt Tame in the Domesday Book's Latin text. The Domesday Book divided the country into counties, hundreds and manors. Each manor was given a financial value, the income expected to be raised from it. The value of the manor of Thame was £30. The boundaries of the land from which this money was to be raised were strictly defined, and had been set in Anglo Saxon times. Thame was a former minster town, in effect a mother church surrounded by a number of dependent hamlets and villages, all of which contributed to the parochial coffers. These included Tetsworth and North Weston. In the centuries after the Norman Conquest the ancient manor of Thame was split up into a number of different manors, each with it own manorial court and its own financial reckoning. Tetsworth and North Weston became manors in their own right. In the twelfth century, the lord of the manor of Thame, the Bishop of Lincoln, granted a former deer park just outside Thame to the Cistercian order, and Thame Park Abbey was founded. This considerably reduced the amount of land belonging to the original manor of Thame. Also in the twelfth century, the Bishop took steps to increase the value of his manor of Thame, and his income from it. He did this in a way lords of many manors were doing, and were to do throughout the twelfth and thirteenth centuries. He constructed a new town. The feudal system as operated in England after the Norman Conquest was an onerous and restrictive regime for the ordinary folk of places like Thame. They were trapped in a state of 'villeinage', something little more than serfdom to the lord of the manor. The new towns being set up across England, and Europe, defined and bestowed a different feudal status on their inhabitants. 'Burgage' replaced villeinage for town dwellers. The principle behind burgage was remarkably modern. Each burger was allocated a plot of land within the town, usually fronting onto the town's main street. All he would owe to the lord of the manor was a financial rent, which he would raise from his commercial activities. His plot of land, with its shop or other premises, was called a 'burgage plot'. The size and shape of the main street was a central part of the new town planning and construction process. The shops were usually lined up either side of a central marketplace, and the 'cigar shaped' design chosen for Thame was a common design of the time. The land on which the new town at Thame was contructed was formerly productive land, partly ridge and furrow fields. In the short term this decreased the Bishop's income from Thame, but the town and its market soon established themselves and began to repay the Bishop's investment. The ancient manor of Thame was further reduced by the new town, losing a prime part of its land. A new manor was set up, called Tama Nova in Latin, and 'New Thame' in English. Around the new town, and outside its strictly defined boundaries, lay the rest of the common fields of Thame, as well as several town enclosures not given over to the town. The heart of ancient Thame, around St Mary's Church, was also outside of New Thame. The remaining land and the residual manor were renamed 'Old Thame'. The following picture is based on a twentieth century map of Thame with the boundaries of the manor of New Thame marked in red. These boundaries are as defined and mapped by the 1823 Thame Enclosure Award. 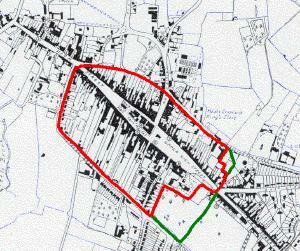 Historical records show that the Bishop of Lincoln allocated fifty acres to New Thame. The green lines are a guess at the original boundaries of New Thame, to make it roughly fifty acres and to account for the irregular eastern boundary. In 1538 Sir John Clerke was pardoned by King Henry VIII for 'depopulating' land, including land at New Thame. This may possibly account for the difference between the red and green boundaries. The burgage plots and cigar shaped market place are clearly visible on this map. Note that New Thame is an island within Old Thame, making the lands of Old Thame a sort of doughnut shape. Old Thame was bounded to the north by the river Thame and its tributary running through the ancient town meadows, to the east by Kingsey and Towersey, to the south by Thame Park, to the south west by Moreton and Tetsworth and to the west by North Weston. Do you live in a village near Thame?